In June 2015 the BUMILLER COLLECTION opened the STUDIO in Berlin-Kreuzberg. The dependence of the University Museum for Islamic Art in Bamberg is located on one floor of a former factory building, now listed, in the Naunynstraße. The STUDIO is a location for temporary exhibitions on the themes of Islam and the Middle East. Changing objects from our museum in Bamberg are integrated into outside exhibitions. A connection between the past and individual and universal values, expressed in the artwork. The exhibition concept of the STUDIO is based on innovation and flexibility. We keep up with the times, trace societal developments and currents in the art world and offer them a creative space for their aesthetic diversity. Thus, an exciting mixed form of museum and gallery is formed which interrogates the present structures in art, moves and even dissolves traditional boundaries. 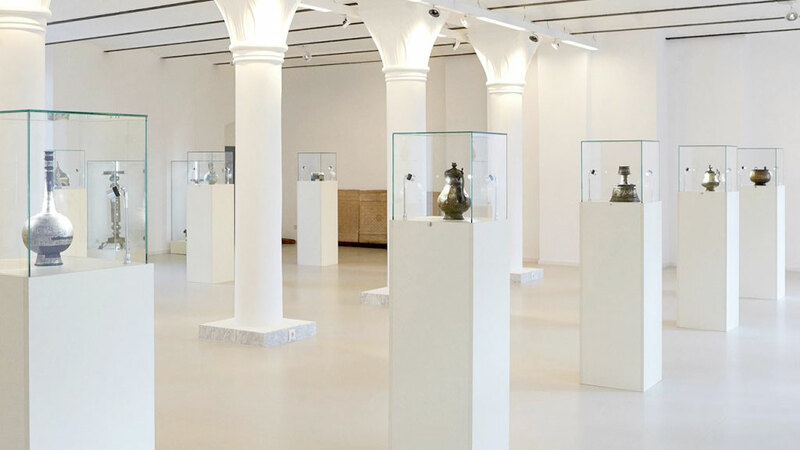 The STUDIO Berlin is a sort of “museum gallery” which confronts the inalienable stock of the BUMILLER COLLECTION with modern works of art by contemporaneous artists. The location in the international art capital Berlin offers in addition to the museum in Bamberg a multi-disciplinary platform for new approaches in the dialogue between Orient and Occident. Concomitant to and along with the exhibitions there are readings, artist conversations and workshops going on. As a site of meeting place for experts and the interested public the STUDIO promotes the scientific and intercultural exchange on art and culture of the Middle East on an international level. The exhibition series “CONTEMPORARY INTERVENTIONS IN THE BUMILLER COLLECTION” specially designed for the STUDIO, which shows the contemporary artists and their works in a dialogue with curated examples of our collection, has become our trademark. In 2016, the STUDIO in Berlin launched the CONTEMPORARY INTERVENTIONS exhibition series in collaboration with Taswir Projects. The underlying concept is simple, yet requires a good deal of sensitivity and intuition in its realization: each respective artist stirs up the ancient art of the Bumiller Collection by confronting their works together with ours, thereby creating a fresh exchange and interrelation between both. 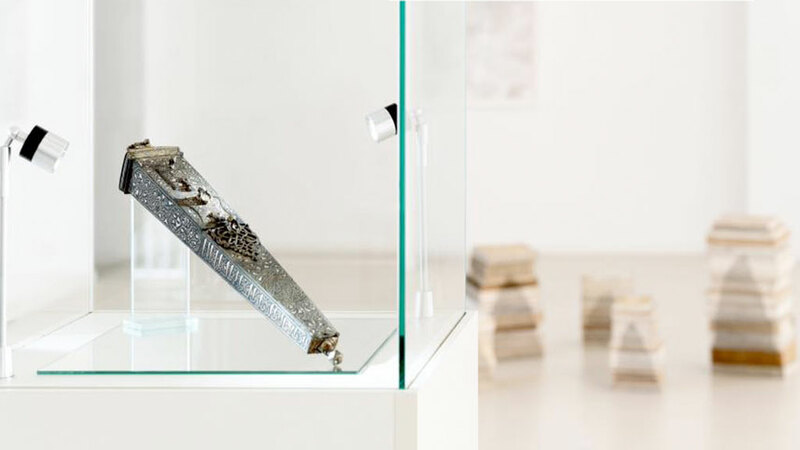 Explored anew with each exhibition is the way in which the artworks and objects are exhibited together, as well as the relationship between these two “worlds”. The Syrian artist Ali Kaaf, for example, chose an associative approach to our pieces, while the South African artist Nicky Broekhuysen, who was featured in the second edition of the Contemporary Interventions, chose a thematic approach. The aim of the Contemporary Interventions is to liberate the exhibiting artists from commercial pressures too often prevalent in the gallery environment, so as to provide them with the greatest possible opportunity for development and expression. This creates a very intimate relationship between our institution and the artists: they are involved in the exhibition process from the very beginning, fully integrated in the decision-making, and we work together to build an exhibition with no predefined outcome. A special form of creativity is encouraged through this approach, namely one constituted out of the engagement with, and interplay between, the collection and the artist. Our objective is to break open the stereotypes, to blur the otherwise common boundaries and clear-cut distinctions of conventional exhibition layouts for antique versus contemporary art, commonplace structures for museums versus galleries, and academic versus non-academic approaches to art, thereby creating fluid transitions between these spheres. All of this happens with the intention of benefiting a new understanding of space and time, with the hope that the works and objects displayed will illuminate each other, consistently revealing new aspects of the pieces themselves and their counterparts. Thursday to Saturday 2:00 till 6:00 pm.